A Doctor Leading The Fight Against Ebola Has Caught The Virus : Goats and Soda Hailed as a "national hero," Dr. Sheik Umar Khan has treated more than 100 Ebola patients in Sierra Leone. Now the 39-year-old is fighting for his life in an isolation ward. 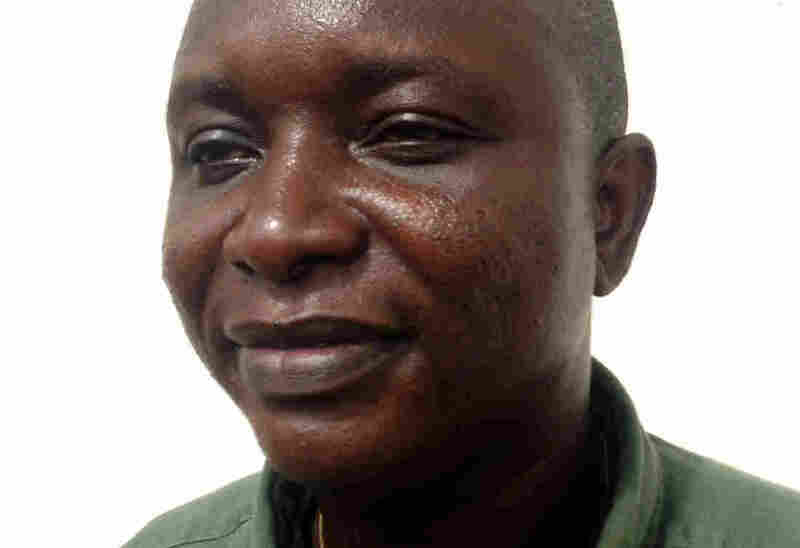 Dr. Sheik Umar Khan, 39, who has treated more than 100 Ebola patients in Sierra Leone, has now been infected with the deadly virus. 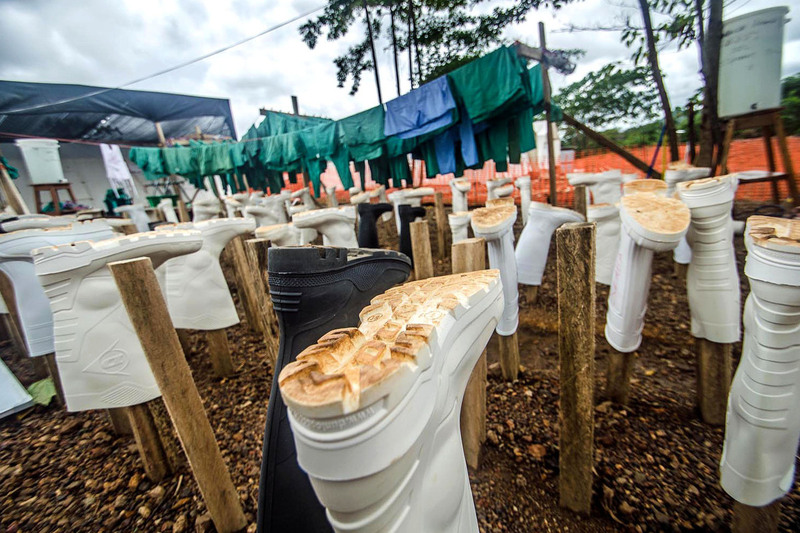 Wellington boots, part of health workers' protective gear, hang out to dry at the Doctors Without Borders' treatment center in Kailahun, Sierra Leone. Dr. Khan is now an Ebola patient in the center's isolation ward. Now the doctor has caught the deadly virus himself, Reuters reports. Khan is being treated at an isolation ward in Kailahun, run by Doctors Without Borders, the Sierra Leone government said in a statement. "He is a very respected medical professional in the country," says Meredith Dyson, a health worker with Catholic Relief Services in Freetown, Sierra Leone. "Everybody here in Sierra Leone is praying for him right now." Since the outbreak started in March, more than 1,000 people have been infected in three countries; 604 people have died, the World Health Organization said Saturday. Sierra Leone has reported 442 cases and 206 deaths. Khan had worked for years treating people for another viral disease, called Lassa fever, which causes symptoms similar to Ebola. When cases of Ebola started to emerge in Sierra Leone, Khan immediately turned his attention to the outbreak and started treating patients at a hospital in Kenema. On Sunday, three nurses at that hospital died of Ebola, Dyson says. "The rest of the nurses went on strike on Monday because they were concerned about the conditions in the hospital," she says. "They felt that they weren't getting the equipment they need to protect themselves from the virus." "That hospital has had huge problems," says NPR reporter Jason Beaubien, who was in Sierra Leone last week covering the outbreak there. "At least eight nurses got infected with Ebola just over a week ago. That indicates severe problems with infection control." The problem has been so severe that Doctors Without Borders sent a team to the hospital this week to assess the situation. The fact that health care workers are contracting Ebola could be a major setback in the fight against this outbreak — especially when the patient is as prominent as Khan. "This is a huge blow," says Beaubien. "And the fact that it is so public is just going to add to the overall fear and the sense among people there's nothing you can do to keep yourself safe." People who have Ebola symptoms may even be reluctant to go to a hospital, he says. "This will further undermine efforts to get this [outbreak] under control," he adds. Dyson is more optimistic. She thinks the news about Khan will galvanize efforts to stop the outbreak. "I do think it's going to bring things to a new level of urgency," she says. Khan knew from the start that treating Ebola patients was risky. "I am afraid for my life, I must say, because I cherish my life," he told Reuters in June. "Even with the full protective clothing you put on, you are at risk."